Make your guests and family feel as if they are living in pioneer days by adding this humidifying kettle to your stove corner. The large, cast iron kettle is far more than a traditional-looking decoration, although the blue/black finish is a valuable stylistic addition to your home. By adding moisture to the air, you will reduce skin cracking, throat scratchiness, and other health issues related to low humidity. 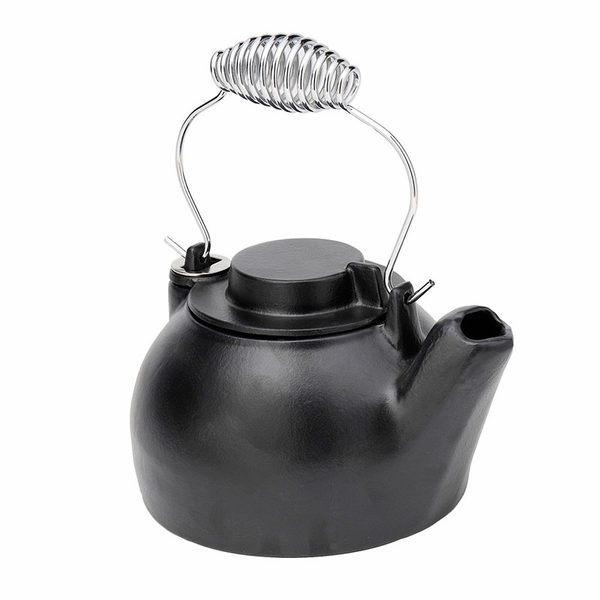 Built to last with Minuteman quality, this kettle holds 2 1/2 quarts of water and features a handle that is easy to grip. Any stove owner would love to receive this item as the ideal accessory for their home. Will this work with a regular open fireplace? You can use cast-iron cookware over an open flame, but you will need a stand or arm of some sort. While the lid can be a little tricky to get off with the handle's placement, we love the sturdy quality of this pot. It has provided the right amount of moisture to our home during the winter and we couldn't be more satisfied. Even though there has been a little bit of rust build up over time on the inside of this product, the exterior still has the shiny stunning appearance that it had the day I bought it. I just polished the exterior, and I am happy to report that it still has the same stunning appearance that it had the day I got it, despite it being a little rusted on the inside. Let me recommend to everyone out there that is interested in purchasing this product that they take a good deal of time to read the metal curing instructions prior to assembling this. I failed to do so, and in my haste to assemble this product, I wound up chipping the handle. I find myself continually kicking myself for this mistake, because on a whole, this is a very stylish product that is extremely attractive to the eye of the beholder. Even though it looks like it is a very easy item to assemble, be sure to take your time and read the directions thoroughly before beginning the assembly process. I just took the time to polish this product , and even though I have had it for close to ten years and it has some rust on the inside, it still looks great on the outside. Originally, we chose to purchase this kettle as a means of humidifying the wood burning stove. What we did not realize was that in addition to its functional abilities, it would wind up being an incredible enhancement to the overall visual appeal of our home. The only drawback with this item is that you do need to assemble the handle yourself. However, over the course of the assembly, we managed to discover why fairly quickly: it has a tendency of chipping. Unfortunately, I had the misfortune of making the chipping problems far worse due to my clumsy attempts to assemble the handle. This still possesses the same stunning appearance that it had the day that I purchased despite being several years old and accumulating some rust on the inside. I am pleased to report that I have had one of these products in my possession for close to ten years, and even though it is a little rusty on the outside, the inside is flawless. Let me start off by saying that this is an elegant kettle that has proven itself to be more than perfect for going along with our wood stove. The only real problem that we had with it was an error in assembly on my part. The metal needs to be cured, and there are detailed instructions included in the packet that are very specific and extremely helpful in making sure that it gets properly cured. Unfortunately, I did not read these directions prior to assembling the kettle, and the result was that I chipped a lot of the metal on the handle. This was unfortunate, since the product really is quite elegant and very attractive to the eye. The handle assembly process on this item proves itself to be a major challenge, and it is one that I want to warn everyone about that is interested in purchasing this product. On a whole, this is a terrific product, which makes it a little bit of a disappointment to spend some time talking about a problem that everyone who purchases it will face inevitably during the course of the installation process. Be very careful while assembling the handle because it has a tendency to chip very easily, thereby making the overall appearance less attractive to the eye. I recommend carefully that everyone who buys this item reads the instructions about curing the handle before assembling it. I definitely recommend this kettle to anyone that is interested in purchasing it, but I also would strongly recommend that the owner be extremely careful during the process of assembling it to make sure that everything is properly installed the first time. In my excitement, I was able to figure out how to easily install the handle, but I soon discovered that the metal chipped fairly easily. This was because I had neglected to read the instructions, all of which dealt with the curing of metal. The end result was that, in my haste, I had done some significant damage to the overall appearance of my kettle.